Contemporary social work cannot be understood without an appreciation of the broader context of social policy in which it takes place. Such an understanding is increasingly important as social workers are expected to work across institutional, professional and even national boundaries in new ways profoundly affected by the changing global context. This insightful book examines how shifts in the dominant political ideology have affected the nature of welfare provision, the kinds of social problems addressed by policy, and the balance of responsibilities for well-being between individuals, the family, voluntary organizations, the market and the state. It explains the impact of these developments on the organization of social work and on relationships between social workers and service users. The book discusses contested concepts central to social work – such as justice, liberty, equality, difference, need and risk – and illustrates these through a range of examples. The critical analysis provided in this book offers students of social work a crucial foundation for negotiating difficult and sensitive practice situations and defending their profession, providing them with the tools and knowledge to uphold key professional values. "Beautifully written and informed by extensive scholarship, Social Policy for Social Work will be of value to a wide range of audiences. Students will find its accessible style most helpful, and academics will find it a vital reference point for teaching in this area. It is really excellent and I recommend it wholeheartedly." "This book will be essential reading for social work students, practitioners and educators. 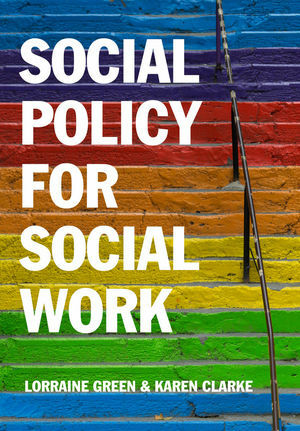 It makes a uniquely thoughtful and analytical contribution to the knowledge base for practice, and offers a comprehensive introduction for social workers to contemporary thinking in social policy. A must read!" "Social work is intrinsically impacted and, in part, defined by its context of social values, social theories and social policies. This book brilliantly explores these interactions and also why social work is a profession which should be treasured and championed. I found it informative, illuminating and invigorating. I expect you will too." "Lorraine Green and Karen Clarke have produced a book that is well written, and in fact in places is exquisitely written. ... This really is a must book for social work students that are studying social policy."